Flynn Carsen has chosen a team of librarians to help him in his endeavors. Together, they solve seemingly unsolvable mysteries, retrieve important and powerful artifacts, and battle against threats that are supernatural in nature. The main threat that is a concern to them is the Serpent Brotherhood, which is led by an immortal being named Dulaque. With a series of quests to accomplish, the group sets out on multiple adventures. This team is very diverse, with each person coming from a very unique background; thus, each person has a great deal to offer as they embark on their many quests. 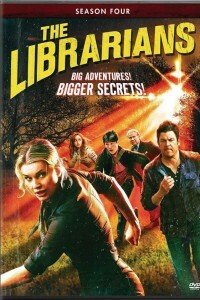 In Season 4 of “The Librarians”, Flynn Carsen (Noah Wyle) receives a dire warning from the past that there can only be one Librarian lest a civil war break out among the Librarians once again. This pushes Flynn to make a dire decision of his own and Eve Baird (Rebecca Romijin) to make a choice she doesn’t want to make. Her hesitancy causes the Library to put the team on trial to decide which one will finally take on the mantle of the one and true Librarian. The trial, however, leads to unexpected consequences that threaten the very existence of the Library itself.